Set in 1935, Modern Girls introduces us to Rose and Dottie, a mother and daughter whose lives seem vastly different until they both find themselves dealing with unplanned pregnancies under impossibly difficult circumstances. At 42, Russian immigrant Rose has raised her family and is ready to return to the social activism she was so passionate about before becoming a wife and mother. Nineteen and unmarried, Rose’s daughter, Dottie, is just beginning her life as a modern, promising career girl—a far cry, she believes, from her traditional, Yiddish-speaking mother. As both women grapple with life-altering decisions, the hopes they hold for themselves and their loved ones and the dreams they feel slipping away drive them to secrets, desperation, and unanticipated journeys. Told in alternating, compelling points of view, Modern Girls a novel of mothers, of daughters, of societal pressures, and of womanhood, and it immediately nestled its way into my book-loving heart. Jennifer S. Brown is a master storyteller. From the first pages, I was transported to 1930s New York and consumed not only by Rose and Dottie’s stories and voices, but their lives. Each woman shared a distinct, engrossing, and compulsively un-put-downable narrative, and I cared so very much about what would happen to them. Entrenched in the authentic details of the time, from Dottie’s in vogue dresses to the ambiance of lunch at the Stork Club, I felt like I was living these characters’ lives right along with them, one critical moment at a time. Like Dottie and Rose, I focused on the now while trying to picture what the final outcome would be—torn between hoping for the best, fearing the worst, and unsure at times which was which. Never once did the turn of events feel predictable, and even after I finished the final chapter, I needed to know what would happen to this family next. 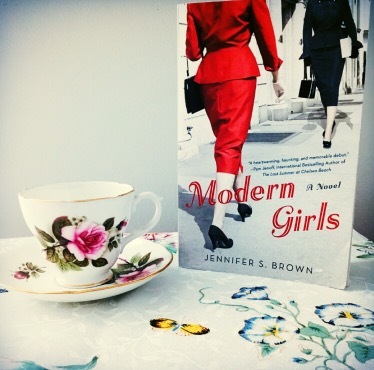 Modern Girls is a beautiful novel as timeless as the themes running through it—themes of family, of maternal love, and of the secrets we keep. I can’t recommend this book highly enough, and I can’t wait to see what comes next from Jennifer S. Brown. For more on the wonderful Jennifer S. Brown, visit her website and be sure to follow her on Facebook and Twitter! I doubt ifor I like this kind of book but your review makes me want to give it a chance! Fantastic. It looks like we have a lot in common when it comes to books…check our my page and maybe we can talk books! Thank you so much!! I definitely will! !